Every home produces its own type and amount of waste depending on the season, period of time and activities taking place within it. Some homeowners do not see a reason to hire a skip, and believe that the waste from their homes is too little to require them. 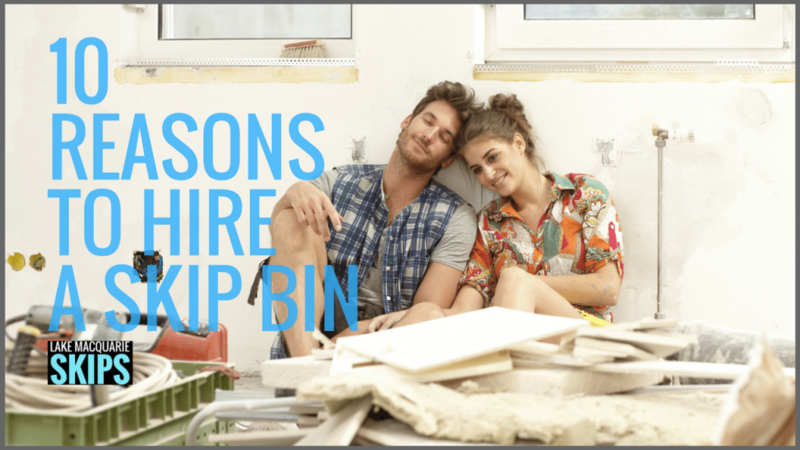 Below are some of the reasons why they should hire a skip bin for better service. Hiring a skip bin is a simple and quick way of dealing with occasional large volumes of waste. All you need to do is contact a skip hire service of your choice, pick out your required skip size, have them bring it to your property and then start filling it with rubbish. For the most part, there is no hidden technological know-how that you must have. Plus, most of the skip hire companies now have an online presence, making them easy to contact without leaving the comfort of your home. Unless you have someone else to do it, you will still have to collect some of the rubbish such as gardening waste yourself. The skip hire method supports responsible disposable of your rubbish, in a way that is also environmentally friendly. Professional skip hire companies sort the rubbish into categories before disposing of it. Some skip companies have recycling plants that deal with recyclables. Also, both owner and transporter are required to dispose off of their rubbish lawfully, so it’s a civil responsibility. It is a smart move to find out, right from the beginning, all you can about your chosen skip hire service provide provider. You should know where they deposit their rubbish, whether or not they carry out recycling plus how they and where they store their rubbish/waste. Hiring a skip hire bin is not just simple, it is also one really cost effective method you can incorporate for huge volumes of rubbish. Relying on daily rubbish pic- up services can get costly in the long run, especially if you have a source of waste that is constant such as house renovation project or cleaning out the garage. Skip hire companies do it for a less fee and there is the added advantage of doing away with all your rubbish at once rather than paying for every single bag. You should compare prices charged for the skip when choosing which company to hire for the job. Different companies have different fees and charges per skip size. The skip hire service provides the skip to use and then collects it after a designated period of time. Considering the work involved in transporting your own household waste to the landfill, choosing a skip hire service is a better option all through. You don’t have to travel far in your car to dump rubbish. Skips can be placed on your property on the driveway or on the street outsideyour house. Some suppliers also provide a hire and pick up service for you. Some skip sizes also come with doors for easy wheeling in of heavy rubbish such as soil and rubble. There are specific regulations in some Australian towns that restrict the size of skip that can be placed on the street. You have to keep that in mind to avoid unnecessary paperwork. It is no secret that by the time rubbish is picked up, most of is usually rotting or worse. Even though the contents of each household’s rubbish may differ, the reality is that most homes have the same type of rubbish and most of it naturally rots and stinks. Skip bins are metal in nature. In addition to the plastic bags the rubbish is initially placed in, the metal form is good at keeping the bad odour out and allows for the skip to be placed anywhere on the premises. Desist from putting rubbish in the skip before placing it in plastic bags first. It makes the skip dirty, messy and smelly when opened. Even some rubbish pick-up services have rules against that. While some domestic rubbish sources, such as kitchen renovation, might happen once in a while in the average home, others such as falling leaves and branches within the garden are more regular. The latter is an example of a nature based source of rubbish whose occurrence is usually daily. Collection of such rubbish becomes a daily task that also accumulates a great deal of waste which in turn requires bigger collection space. For waste such as this, a skip is generally the better option since it holds rubbish for longer and has space for more rubbish over a long period of time. There is such a wide range of skips to pick from when you decide to hire. The skips hired come in various shapes and sizes, providing options to choose from depending on your requirement. The variations accorded to the skips on market today are many. Some, for example, come with lockable lids to prevent neighbours from adding their rubbish to your skip in your absence. The supplying companies also have manuals that offer guidelines on how to choose the right skip size for your job. This makes using skips for domestic projects the more practical option. It is a common mistake to hire a skip bin whose size isn’t fit for your requirements. It could be too small for your household refuse or too big and subsequently expensive when it comes to charges and fees. Remember to ask which size fits your need better before making a purchase. With the exception of a few potentially hazardous materials such as batteries, asbestos and certain chemicals, every other kind of solid waste is practically allowed in the skip bin. Considering how varied domestic waste can be, this feature makes skips very useful for any domestic situation and saves homeowners lots of time and money. From broken bricks to pieces of glass to old shower curtains from bathroom renovations and from broken tiles to party excesses, everything can be deposited in a skip. You have to follow the guidelines given by the skip hire company not to mix certain waste with normal waste. This is because such waste is potentially dangerous to both individuals and the environment where it is deposited. Skips take a lot of rubbish at once allowing for orderliness and cleanliness even during long running demolition and renovation projects. The number of bags of rubbish that a single skip can accommodate varies with the size, with smaller skips taking a maximum of 35 bags while larger ones can accommodate a minimum of 100 bags. This enables you to fill a whole month’s waste in one bin and have it all carried away at once. Some skip hire companies have strong limitations on how high up you can you fill your skip and have a fee for each extra space you cover. Most charge differently for picking up different skip sizes, the fee increases with the size of the skip.